Mix water and honey into a large mixing bowl. Allow to sit for 10 minutes. Begin mixing in the flour one cup at a time. Add salt and walnuts at 3 cups. Add remaining flour. Turn dough out onto a floured work surface. Allow to rest for 5 minutes. 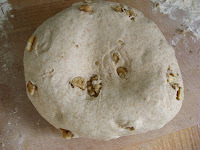 Begin kneading dough adding four as you go until smooth and elastic, about 10 minutes. Form into a ball. Coat a large bowl with olive oil. Turn dough around in bowl to coat the surface. Cover with a kitchen towel and let rise in a warm, draft free place until about doubled in bulk (aprox 1-1/2 hours). Punch down dough. Return to work surface. Divide in half with a sharp knife. Form into two "logs" and place in 2 greased loaf pans. Sprinkle with flour and slash surface with a sharp knife. Cover again and allow to rise until doubled (45 min or so). Meanwhile, preheat oven to 425. Bake for 15 minutes on middle rack, then reduce heat to 375. Bake until golden and hollow sounding when tapped. Allow to cool on a wire rack before slicing and serving warm with good organic butter! Wow, this looks delicious! And I love that red ceramic loaf pan in your picture, you could take that straight out of the oven and put it on your table! Thank you! The loaf pan is my absolute favorite, given to me with a matching casserole dish by my brother and sister-in-law. They always give the coolest gifts!